We call this our two sense sensation. Allow your nose to enjoy the fragrance of this particular variety of lemon first - an unusual, sophisticated lemon cordial. Made from fresh passionfruit, this is a subtle addition to our organic lemons. You might not recognise the flavour, but you will love it! A classic combination – our orange and lemon is exactly that …. Orange, orange, orange flavour on the tongue and then lemon. Perfectly balanced. Surprisingly mellow, refreshing and light in flavour. This is great with prosecco, sparkling water, as an aperitif or palate cleanser between courses. For those who love blackcurrants as it really does taste of blackcurrants. Sharp, flavoursome cranberries sweetened with organic oranges. Yummy! Loved for its raspberry berryness cut with lemon. Described as “an extraordinary balance of flavours”, we have used cucumber to freshen the taste of strawberries and added lime to prevent it getting too sweet. We only use fresh strawberries for our cordials so this is seasonal. When asked to make a strawberry cordial, we came up with this. The raspberries add depth to the flavour and prevent the strawberry flavour becoming too sweet. 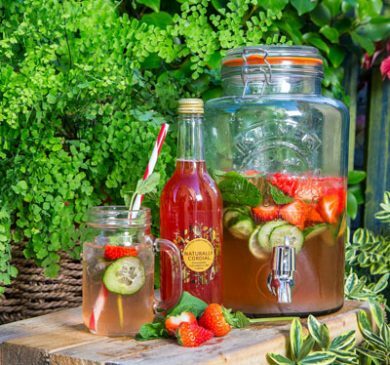 We only use fresh strawberries in our cordial in order to keep that true strawberry taste. An usual combination that tastes surprisingly good. Fresh strawberries with a tropical taste! 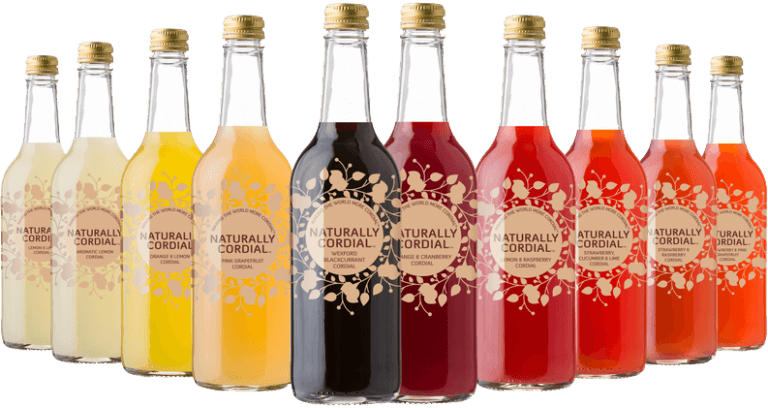 You can buy Naturally Cordial in a wide variety of shops and supermarkets across Ireland. To find the nearest stockist to you, simply enter your location in the box below. One of the best ways to keep in touch with us and see what we’re doing is to follow us on Facebook. There are many ways to enjoy Naturally Cordial, and some of them might surprise you. Here are some interesting recipes for you to try out at home. 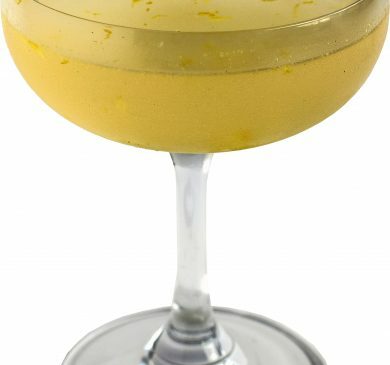 This cocktail is made using Chinnery Gin and our Pink Grapefruit Cordial. It's perfect to enjoy before any dinner party and this serve will make 4/5 drinks.